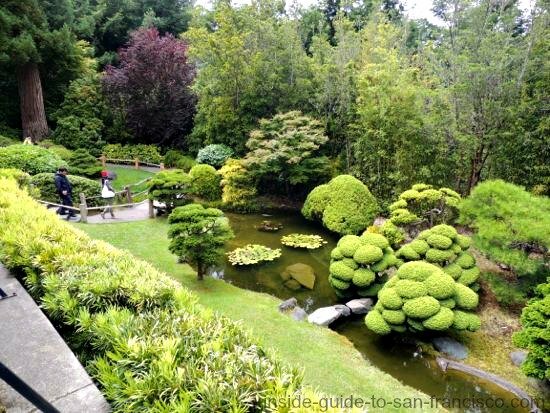 Come and relax in the Japanese Tea Garden in San Francisco. It is a popular tourist attraction, but it's still a peaceful and lovely place to wander. The Tea Garden is definitely worth a visit; the locals love to come here as well. I started coming here as a young child and then brought my own child here too. 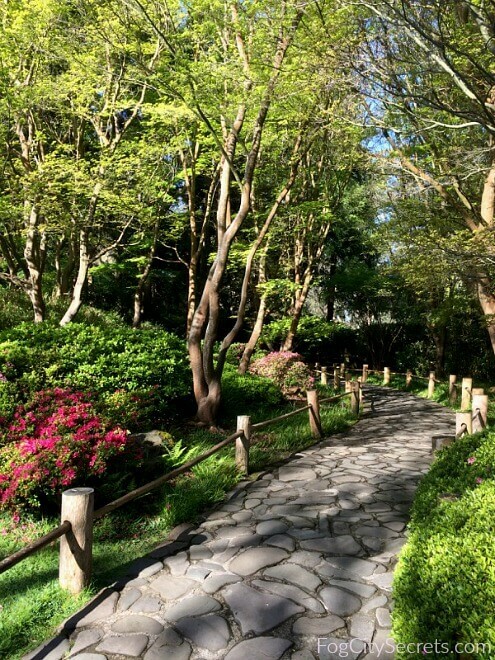 The winding paths travel across wooden bridges and stepping stones, past koi ponds and pagodas. 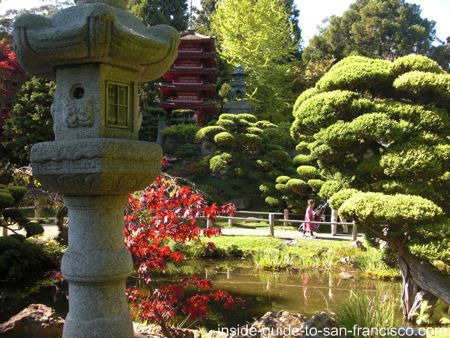 Enjoy the colorful temple gate, peaceful Zen garden and acres of beautiful plantings. After wandering through the tranquil gardens, you can sit in the natural setting of the tea house and enjoy authentic Japanese refreshments. 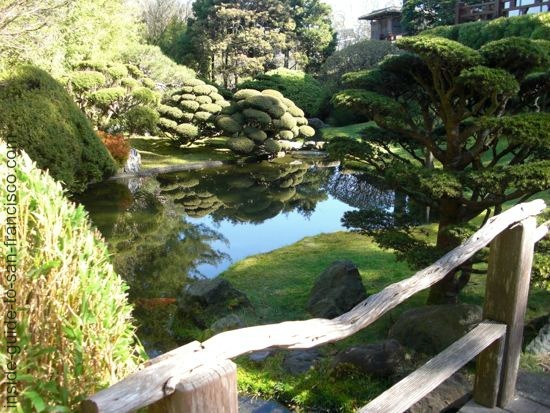 It's the oldest formal Japanese garden open to the public in the United States. 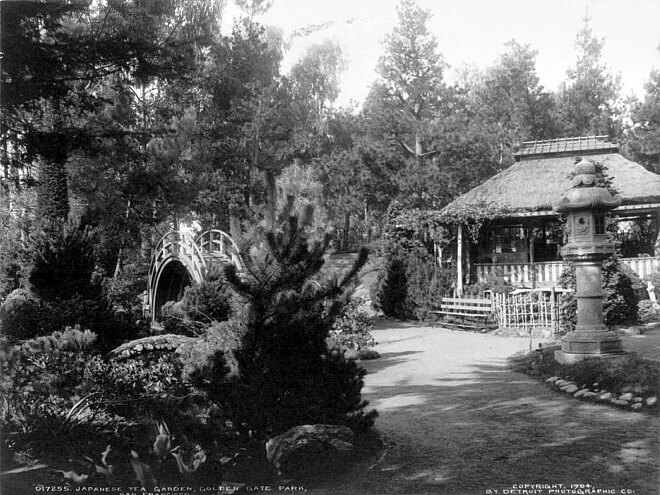 The Tea Garden arose out of the Japanese Village exhibit built for the 1894 World's Fair in San Francisco (California Midwinter International Exhibition). 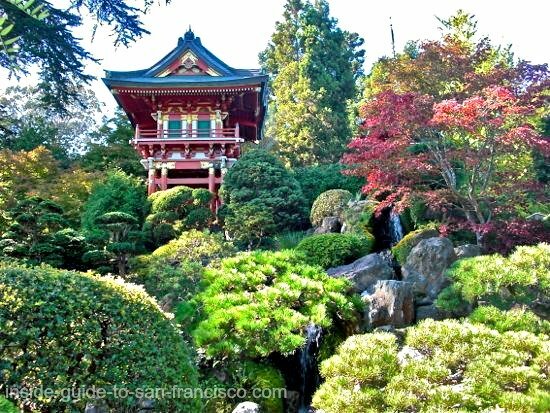 Makoto Hagiwara, an immigrant from Japan, created an authentic Japanese tea garden in Golden Gate Park, contributing many valuable sculptures, structures and plants. He and his descendants were caretakers of the garden until 1942. During the war, anti-Japanese sentiment led to the Hagiwara family being interned and the garden was renamed the Oriental Tea Garden. The garden went into a decline and many artifacts were stolen. After the war, the garden got its original name back and the street was named after Mr. Hagiwara. 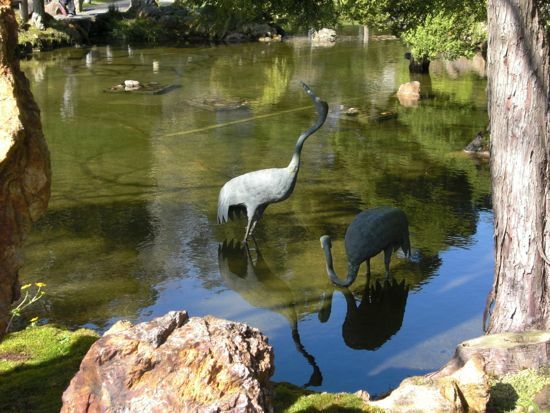 For the past fifteen years, the Japanese Tea Garden concession had been under other management, but in the summer of 2009, the garden returned to Japanese hands. Most of the servers in the Tea House are now Japanese (or Japanese-American). 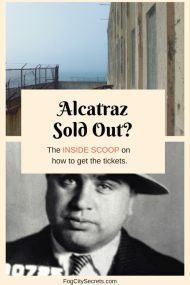 There was an article in the San Francisco Chronicle about the controversy surrounding the change. Origin of the Fortune Cookie. 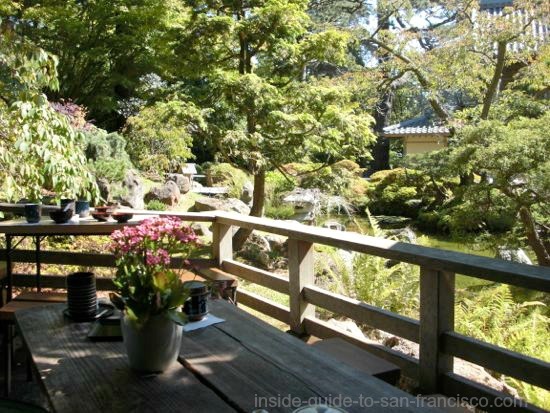 The Japanese Tea Garden in San Francisco was also, oddly enough, the first place in the world to serve fortune cookies as we know them, although something similar had been sold in Japan many years ago and was probably the inspiration. 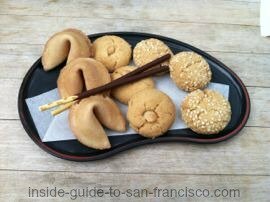 Mr. Hagiwara introduced the U.S. to fortune cookies around 1900, serving them in the tea house, and they eventually spread to Chinese restaurants in San Francisco, then all over the world. And they still serve them here: probably the only Japanese establishment in the U.S. that does! After entering the enclosure through the Japanese gate, take time to wander along the paths and over the bridges. The exquisitely landscaped grounds cover five acres, so there are plenty of beautiful spots to explore. The tea house overlooks a koi pond, surrounded by Japanese azaleas and bonsai trees. 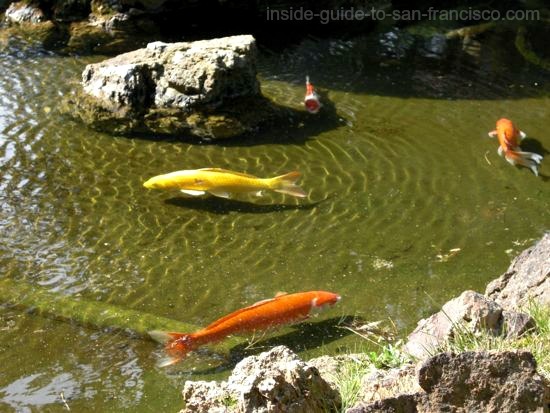 The koi ponds are full of plump, healthy-looking fish in gorgeous colors- brilliant yellow and fiery scarlet, as well as the more classic patterns. In an out-of-the-way spot, you will come upon a raked-stone Zen garden designed for peaceful contemplation. 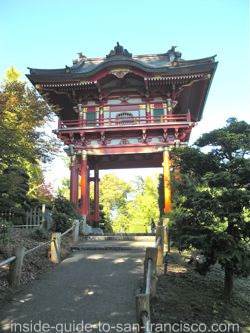 On the upper level, an ornate Japanese temple gate leads into an area with a colorful pagoda, both created in 1915 for the Pan-Pacific Exhibition. 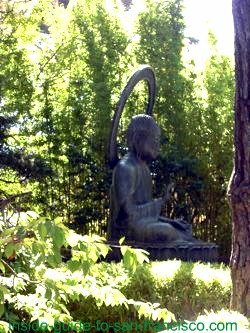 A bronze Buddha is nearby, cast in Japan in 1790, and donated by the Gumps Company in 1949. As a child, I loved climbing the high arched drum bridge, and it's still a lot of fun! 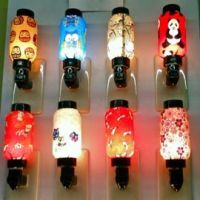 The color varies over the decades; I remember it being bright red in earlier years. 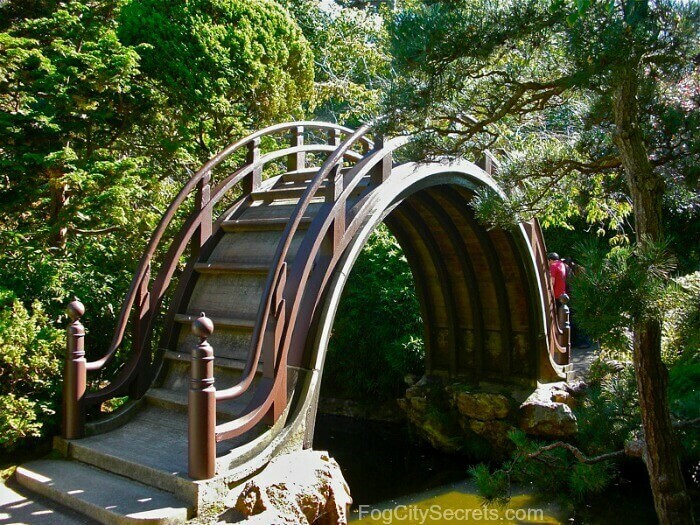 This bridge, also called a moon bridge, was built in Japan and shipped here in 1894 for the San Francisco Midwinter Exhibition. There is such a feeling of peace in the garden, even on a busy day. The visitors seem to melt into the greenery. When you're done exploring, be sure to stop for tea and treats in the rustic tea house overlooking a koi pond. The tea house has changed their menu again. There's an assortment of traditional Japanese snacks and desserts to try out, along with some fruit-flavored Japanese children's drinks that you don't often see. How about some green tea cheesecake; it's quite good! 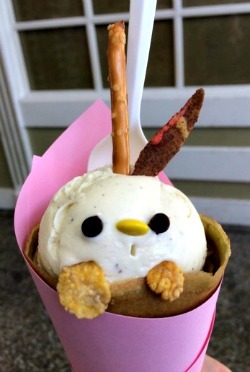 Check out the Japanese Tea Garden Menu, with photos of some of the choices. Order and pay at the counter, and the server will bring it to your table. 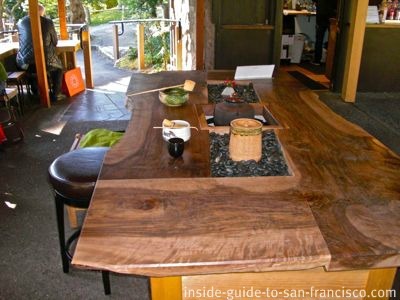 The tea house has added a large table in the center designed for traditional Japanese tea ceremonies. The ceremonies aren't being offered at the moment; hopefully they will start doing them again! Summer (Mar 1- Oct 31): 9 am to 6 pm. Winter (Nov 1 to Feb 28): 9 am to 4:45 pm. Entry is free between 9 a.m. and 10 a.m., Monday, Wednesday and Friday. Tea House and gardens in spring...best time to go. When to Go. Absolute best time is when the cherry blossoms are blooming, in March and April. Otherwise, sunny days, year round, are the best time to go, because it should be warm enough to enjoy the stroll through the gardens. The winters here aren't that cold (mid 50's usually) so if you're wearing a jacket, it's OK. The tea house is an open air building, no walls, so it will be the same temperature as the outside. Golden Gate Park is on the foggy side of San Francisco, so visiting during Fog Season (May, June, July) may be a bit gray and damp; but it does give it a rather mysterious look which is pretty cool, too. Time of Day to Go. Afternoons tend to be the most crowded, but if you avoid the prime lunch period (11:30 to 2:00) you shouldn't have to wait for a table at the tea house. Free Entry. You can get in free between 9 am and 10 am on Mondays, Wednesdays, and Fridays. What to Eat. The menu has changed again. 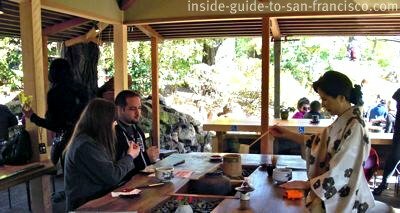 The large assortment of snacks has been pared down, unfortunately, but it's still very pleasant to have some Japanese tea and snacks in the charming setting of the tea house. See the Japanese Tea Garden Menu. New Gift Shop. I'm not a fan of touristy gift shops, but the new managers have cleared out the piles of junky kitsch from the shop behind the Tea House and present a very attractive array of high-quality Japanese items, as well as some cool Japanese knick-knacks. Things Have Changed. For those of you who visited over the past few years and were a bit disappointed in the Tea Garden, it is now under Japanese management again and it's back to what it used to be. You are greeted warmly, the tables are clean, and your tea is served with grace and courtesy. Also, the grounds are immaculate and the ponds are clear. 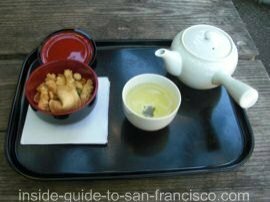 The Tea Garden is next door to the de Young Museum on the Music Concourse, near the California Academy of Sciences in Golden Gate Park. See map. 44 O'Shaughnessy bus. Stops at the Tea Garden inside the park. 5 Fulton bus. Get off at 8th Avenue, walk into the park and turn right on JFK Avenue. Go past the de Young Museum. N Judah streetcar. Get off at 9th Avenue, walk into the park on 9th, then right on Hagiwara Tea Garden Dr.
From Fisherman's Wharf. Take the F-trolley to Market Street, then the N Judah streetcar (underground Muni) to 9th Ave. 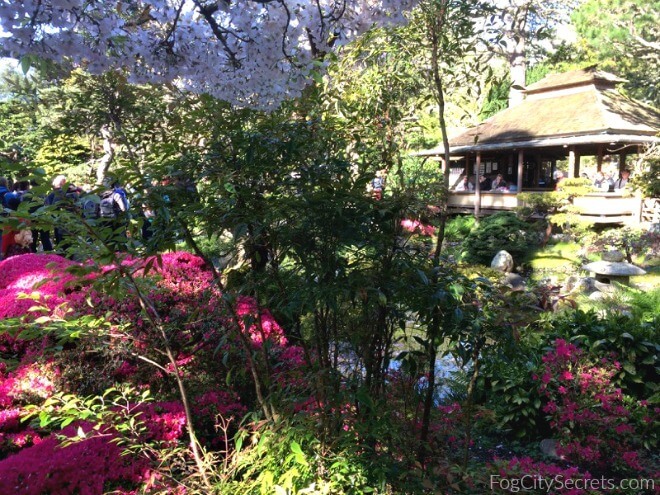 Walk into the park on 9th, then right on Hagiwara Tea Garden Dr.
From Downtown. Go into one of the downtown Muni stations (underneath Market Street) and catch the N Judah. See above. 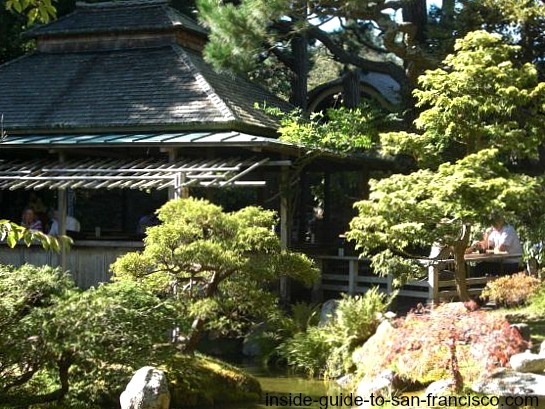 The Japanese Tea Garden is on Hagiwara Tea Garden Drive between Stow Lake and the de Young Museum. You can enter Golden Gate Park either on the south side via 9th Avenue or at 8th Avenue, onto JFK Drive, on the north side. Parking can be tricky, especially in summer and on sunny weekends. There is a parking garage underneath the de Young Museum nearby, with two entrances: one entry off Fulton Street at 10th Avenue, and another at the west end of the California Academy of Sciences on Concourse Drive, just off MLK Jr Drive. ($ 2.25/hr Mon-Fri; $3.25/hr Sat-Sun. VISA, MC accepted.). Marked on map below. 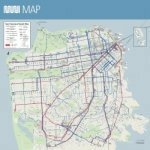 Ideas for parking spaces: there can be spaces on JFK and Martin Luther King Drives on either side of the Tea Garden (MLK is the better bet usually, and JFK is closed to cars Saturdays and Sundays). 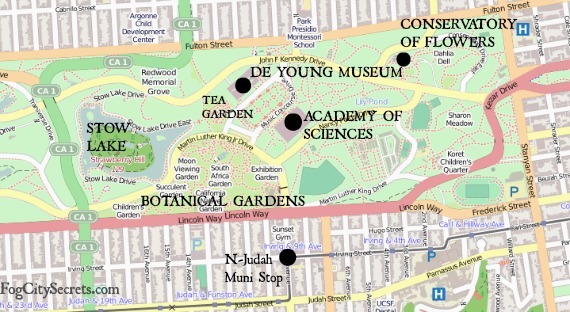 There is no parking on the road that goes past the Tea Garden (Hagiwara) and loops around past the Academy of Sciences and the de Young Museum. Another possibility is street parking outside the park near 10th Ave, with the north side being less challenging, but parking in that neighborhood is tough. 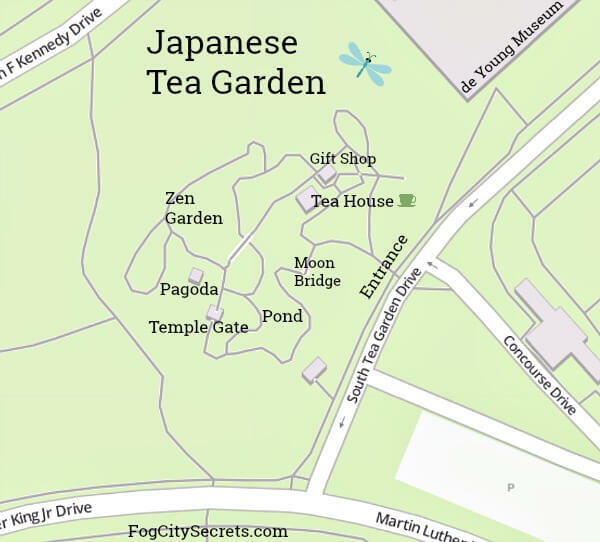 Fallback suggestion: If the streets near the Tea Garden are packed, try parking around Stow Lake; there are almost always places available around the loop. It's only about a 10 minute walk from there. 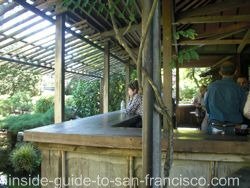 Discover all the cool things to do in the park in my Complete Guide to Golden Gate Park. Main attractions and hidden gems. The Japanese Tea Garden Menu. Take a look at the list of menu items and photos. 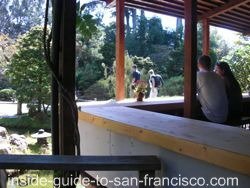 Looking for a good sushi restaurant near Golden Gate Park? You See Sushi is a cheap and tasty sushi place near UCSF (and walking distance from the Tea Garden). Golden Gate Park has lots of other gardens to explore, too. Visit the Rose Garden, Redwood Grove, Shakespeare Garden, and more. 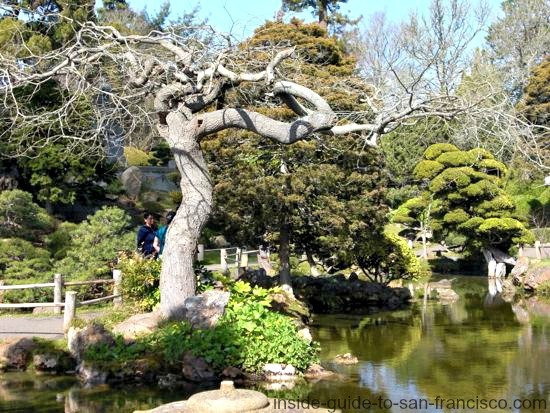 For info, garden maps and photos, see Gardens in Golden Gate Park. 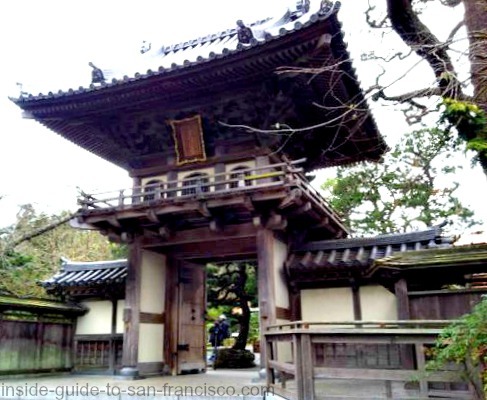 San Francisco has one of the three remaining Japantowns in the U.S. This is a cool neighborhood to explore and less touristy and crowded than Chinatown. 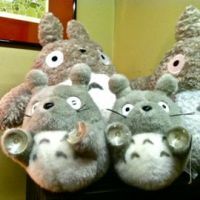 You can check out the authentic Japanese shops and restaurants in Japantown.